This is the cheapest price for this hand held cordless vacuum cleaner. It's considerably cheaper than elsewhere and you can get TCB or Quidco too. Reading the various reviews around the internet, this thing is better overall value for money than the Dyson hand helds, and this is why I've just ordered one myself. Supposedly better battery life and larger dust capacity than the Dysons though the suction may not be as good. Basically, this seems to be the mid point between the cheap handhelds which cost up to £40 and the over-priced Dysons that cost over £130. At this £60 price (supposed to be nearer to £90 normally I hear?) I think this item is probably the more sensible option, but that's just my opinion. Clean up small spills and dust in minutes with the Black & Decker Dustbuster Pivot Handheld Vacuum Cleaner! This compact easy-to-use cleaner has a powerful 18V battery to clean up small areas in a jiffy! 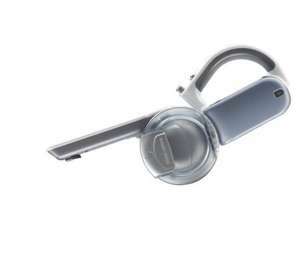 One of the highlights of the Black&Decker Dustbuster Pivot Handheld Vacuum Cleaner is the nozzle design that allows it to pivot to 200 degrees, ideal to access any kind of awkward corner. The pivoting nozzle has 8 different settings for maximum flexibility, while the cyclonic action keeps the dust away from the filter to maintain suction power. The translucent dirt bowl lets you easily see when the bag is full, and makes emptying cleaner too. It can be completely removed and washed to maintain complete hygiene, as can the filters. The Black & Decker Dustbuster Pivot Handheld Vacuum Cleaner also has a special crevice tool and a soft brush integrated into its design! Once the cleaning is done, you can fold it in half to make storage and charging easier too. Keep the Black & Decker Dustbuster Pivot Handheld Vacuum Cleaner handy to clean up spills and dust any time! I have one of these 18V units and it's very good. I paid this sort of price for a B&Der 18V models, but they have been as low as £40. However I got mine with a load of vouchers so the price was less important to me. I would certainly buy another one at this price. I have one of three and they are great, as good if not better than Dyson and a hell of a lot cheaper! Have the older version of this which I got from Amazon for £35. Battery died after a year (2yr warranty) which was fixed by B&D at the nearest centre. Really good machine with good support. The battery life on my old Dustbuster Pivot has finally dropped to unusable levels (it's several years old) and this is probably cheaper than replacing the battery.